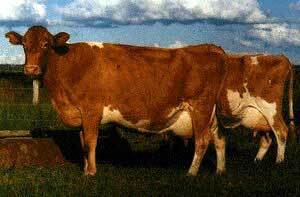 Data from herds enrolled in the American Guernsey Association's Dairy Herd Improvement Register program during 1992 shows the breed average to be 14,667 pounds of milk, 659 pounds of butterfat and 510 pounds of protein on a mature-equivalent basis. Today, although Guernsey breed numbers are steadily decreasing as the total dairy cow population decreases across the United States, the commitment of the AGA Board of Directors, staff and Guernsey breeders is stronger than ever. 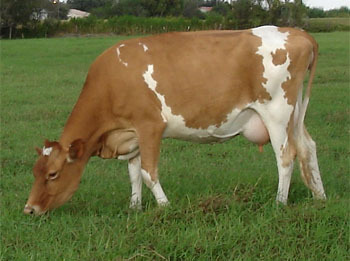 Evidence supporting the ability of the Guernsey cow to compete effectively can be found throughout the country. 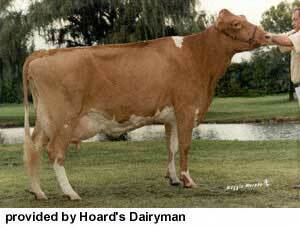 Take advantage of Guernseys and join others who are taking advantage of this profitable cow! American Guernsey Association, 7614 Slate Ridge Blvd., P.O. Box 666, Reynoldsburg, Ohio 43068-0666. Phone: (614) 864-2409.